What The Hell Is Going On In This Old Mazda GLC Ad? The Mazda GLC (also known as the Familia, and later the 323) was a charming little late ‘70s to early ‘80s-era econobox. Unusually for a little hatchback, it was front-engine/rear drive. Also unusual is this puzzling ad for the car. Let’s just look at that image and try and figure out what’s going on. The scene is a soccer field — you can see the goal in the upper left there. There’s two couples, each driving their own brand-new GLC. The ones who seem to be with the white four door have an R/C airplane and a hatch full of suitcases. The couple in the blue two-door, now, they came to that soccer field dressed and equipped for a game of tennis. The woman, who looks like a 14 year old boy, is holding a racquet and everything. Are these people friends? Do they do this every week, pick a random sports-related field and then show up with equipment of two unrelated sports? Maybe they then try and figure out a way to make it all work? What else could this be? Are the couple with the luggage and R/C plane planning to use an experimental shrink-ray and then board the plane, tiny luggage in tow, and head to Paris? Or maybe this is the start of the strangest four-way ever planned via postcards? Perhaps they’re just the worst possible communicators ever known? Maybe we’re seeing the results of the most confusing answering machine messages known to man? It’s fascinating and subtle. 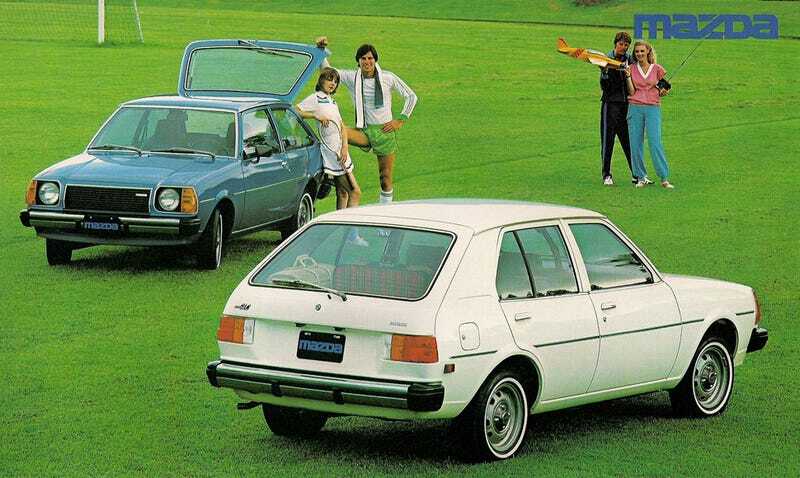 I also like that this was an era when a small hatchback was considered just fine for this sort of confusing thing. Today, those cars would both be crossovers or SUVs. I want to hear your theories, too, so have at it, why not?